I rather enjoyed being a tourist in Ireland. Here are some of the touristy highlights . . . and a few lowlights of our trip. Without a doubt, the culinary highlight was the wild smoked salmon at the Connemara smokehouse. The lowlight was Irish beer, or rather, the singular lack thereof. As I no longer drink (booze bad for an injured brain), this was more of a concern for Tom than me, but I shared the disappointment when we spent half a day driving to a microbrewery we had heard tell of . . .which had actually closed down. I confess that we ended up here because it was a very rainy day, and the entrance price included a cup of tea (a genius touch), but the place was an unexpected delight. It is hard to explain exactly why the Doagh Famine Village is so good without spoiling its many surprises . . . but I do recommend a visit if you are ever on the Inishowen Peninsula (which is, by the way, a lovely spot). 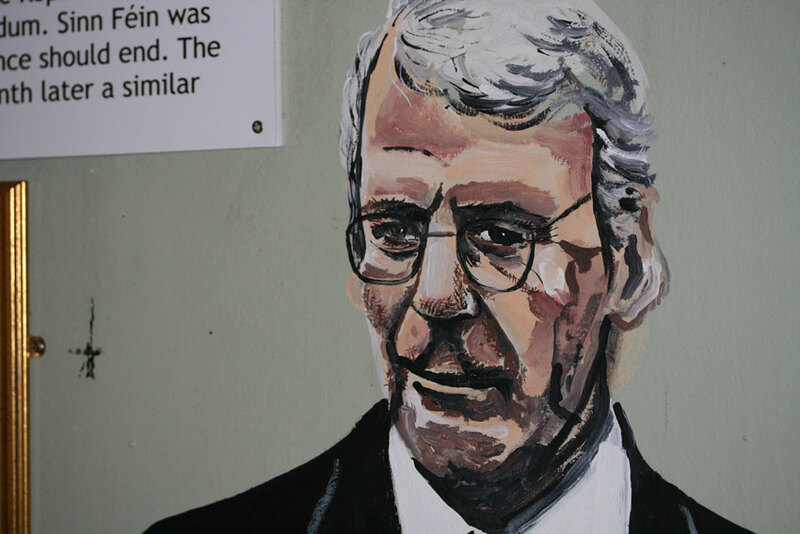 I would describe Doagh as an ‘attraction’ whose ostensible purpose is to celebrate the culture and resourcefulness of the people of Northern Donegal. It succeeds in this aim admirably, but what makes it all the more interesting is the way that the ‘village’ has expanded beyond its original remit (and boundaries) in an enthusiastic attempt to represent All Irish History and Culture at All Times . . Ever. This, of course, is a totally impossible task, but it is a laudable one, and the way history is presented is actually refreshingly original when compared to many official (ie, publicly funded) ‘heritage’ attractions. I think what I really liked about Doagh was that it had a Point of View and it wasn’t afraid to make it. Where else could you find a display about absentee eighteenth-century English landlords tellingly juxtaposed with a critique of the apricot-coloured holiday mansions that one sees everywhere in Donegal? At times, these idiosyncrasies do tip over into the faintly absurd – nowhere more so than in what I can only describe as The Peace Process House of Fun. Here, the unsuspecting visitor suppresses their claustrophobia and navigates their way around a republican safe house, locating several ‘hidden’ rooms, until they find Ian Paisley and Jerry Adams sitting down together. I couldn’t quite believe it was real . . . but it really was. 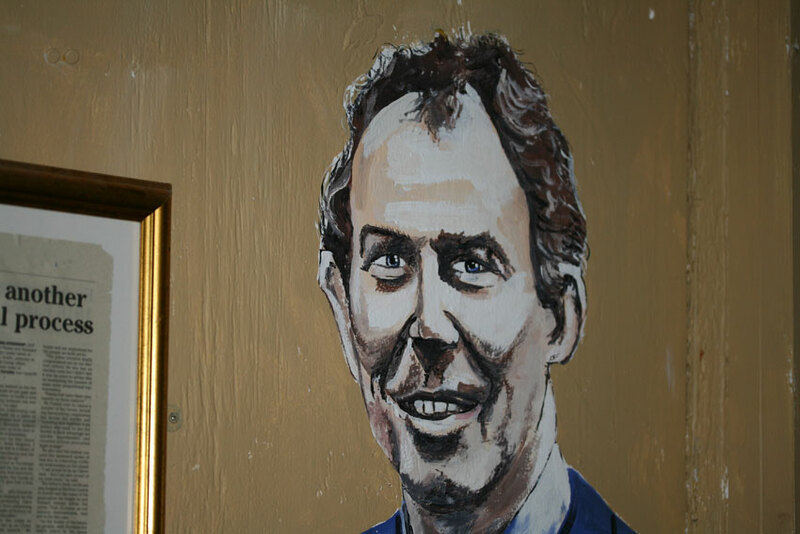 Curiously, Tom and I seemed to be the only ones who found the discovery of former prime-ministers behind fireplaces and wardrobes hysteria-inducing . . .
. . .but there you go. The tea, when it came, was a proper cup of tea and it was served with jam and bread. Brilliant! I heartily recommend Doagh. It has to be seen to be believed. This is a tie between two places. The first is the Glenveagh National Park. We popped in at the park’s well-appointed visitor centre to find an OS map of the area so that we could go for a walk. Now, you might think that a place whose business it is to promote the outdoors would be the perfect place to find a map. You would be wrong. The gift shop had novelty sheep and leprechauns a-plenty – but no OS maps. In fact, there were no maps of the area there at all. Confused, we asked at the ‘information desk’ for ‘information’ – could we buy a map – any map of the area? We could not. There were no maps to be had. We were then told that, if we wanted maps, we should go and look on the internet. The internet! I really wanted to say: “Look, we are standing right here in front of you, in your visitor centre, dressed in our walking gear, asking for a map, so that we can just go for a walk in your national park. ” But we are British, so we politely replied “Oh, right, we see. Thankyou.” and left the building. It seems, at Glenveagh, that the great Irish outdoors is only to be enjoyed if you pay several euro to be shipped out to it on a bus, and access it as part of a pre-packaged ‘nature experience’. I would still recommend visiting Glenveagh, as the landscape is spectacular, and clearly very well-managed. But one place I would not recommend in any capacity is the Leenane Sheep and Wool centre. If you are a child, or the parent of one, and know nothing at all about sheep or fibre, then you might spend a fun couple of hours here. If you are a knitter, spinner, weaver – or anyone with any sort of interest in textiles – then I really wouldn’t bother. The best thing I can say about this place is that I learned a few things I did not know about the development and extinction of some breeds of Irish sheep. But I had come hoping to find out a little more about the weaving industry in this part of Ireland, and I was sorely disappointed. I learnt very little about Leenane tweed, and nothing at all about what distinguished it as a cloth. In one room, ‘Irish’ dyeing was illustrated with some skeins of Scottish yarn, and the whole experience was accompanied by not one but two competing soundtracks of ‘Irish’ music that made it impossible to concentrate. And then there was the usual, predictable gubbins about “each knitted stitch” of an Aran sweater “having its own meaning.” Here I lost patience. It costs 5 euro to be peddled this rubbish. I would not waste your money. 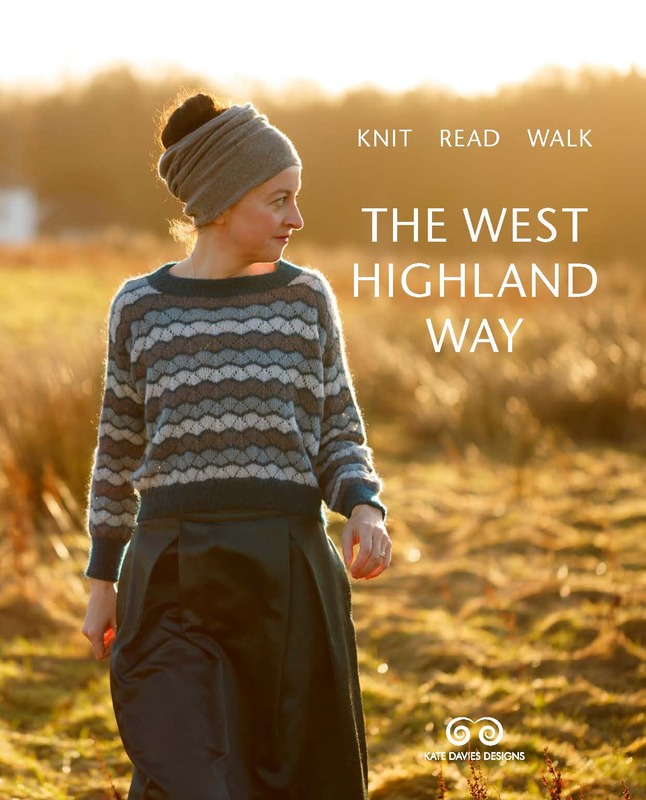 As in some parts of Scotland, Ireland abounds with woollen ‘mills’ that are not, and purveyors of ‘traditional crafts’ which turn out to be sweaters mass-produced in the far east. Down with this sort of thing! At Studio Donegal, one breathes a happy sigh of relief. There is a strong sense of the area’s textile history in Kilcar, but Studio Donegal is very clearly a working business, not a heritage centre. There is a workroom with some fabulous old looms where you can see Donegal Tweed being woven – and, here you are watching working weavers, not a ‘demonstration’ or ‘performance’ of weaving. 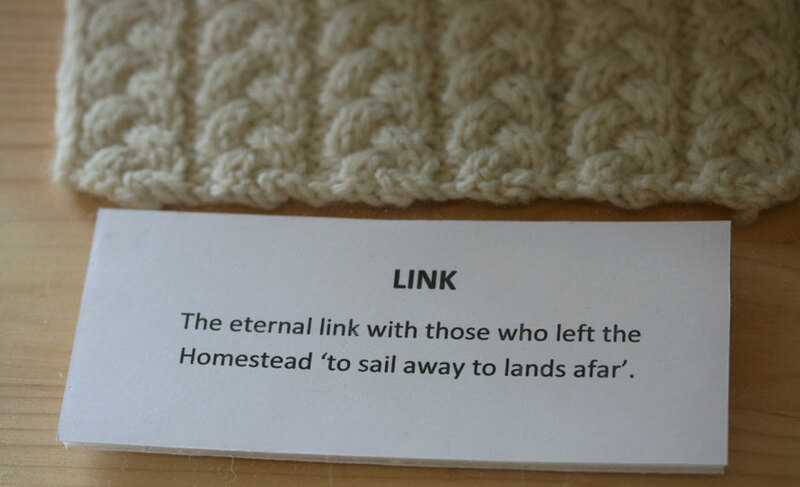 Downstairs is a shop filled with lovely woolly stuff made by the folk upstairs. There are beautiful wraps and throws and blankets. I was particularly drawn to the two-colour graphic designs, which strongly reminded me of Latvian weaving styles. All very nice, I hear you say, but is there yarn? 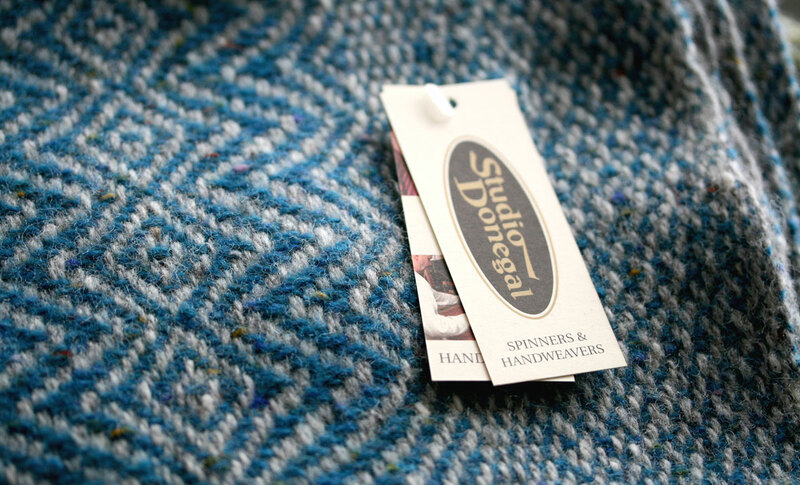 Indeed there is – spun for Studio Donegal just round the corner at Donegal Yarns – and lovely stuff it is too. In fact, if the Veedon Fleece is to be found anywhere in Ireland, I think it might be in Kilcar. While I was enjoying myself at Studio Donegal, Tom and Bruce went for a walk around the village. They were joined by a nonchalant lamb, who walked out of someone’s front door, insisted on making friends with Bruce, having its head rubbed by Tom, and pootling happily along with them. I did not see FRIENDLAMB – and indeed did not hear about it until we were back on the road (badTomandBruce)- but it has already become the stuff of myth. Camping in the wazzwaggon was lots of fun – to say that Bruce loves it is a total understatement – and we surprised ourselves by going ‘wild’ the whole way. We stayed in some truly wonderful places, and only had to share a spot with other campers on one occasion. We are keeping our favourite favourite to ourselves, but Malin Head definitely comes a close second. Great post! Sadly there aren’t so many microbreweries in Ireland but things are changing for the better and about four new breweries have opened this year. When you’re next over check out http://www.beoir.org/ which has lists of pubs that stock Irish craft beers. I’m a hiker and caver and access to the outdoors here is just not as organized as it is in Scotland and the UK. Sad to say that I’ve enjoyed my walking holidays in the UK and Scotland more than I have the ones at home. The access terms are clear where as in Ireland you sometimes have to take a chance and walk across somebody’s land which doesn’t always work out. That said when you do manage to get out there on the hills they tend to be empty so you have the views to yourself. What a thrill to learn about Donegal Yarns and Studio Donegal, right there in Kilcar, where my great-grandmother came from. Now I have an even greater reason for visiting that part of Donegal, and can look forward to bringing something wonderful back with me as a souvenir of my visit. That yarn is amazing, and I am even more determined to figure out how to get to Kilcar. I haven’t been for a couple of years so have not experienced the peace process house. I will be up there before the end of summer and will make a point of visiting. Really looking forward to it. Another textile place worth checking out next time you’re back is the Ulster Folk Museum (just outside Belfast) and the Ulster-American Folk Park in Omagh. Both have really interesting textile collections including clothes, lace and quilts (don’t remember knitting but it’s a long time since I’ve been to either): http://www.nmni.com/uftm/Collections/Textiles—Costume and http://www.nmni.com/uafp/Collections/Textiles—Costume. I also remember strange and fascinating household objects at the Folk Museum, including an entire set of horses’ harness woven out of rushes – exquisitely made, but hard now to imagine the level of poverty which must have produced it. 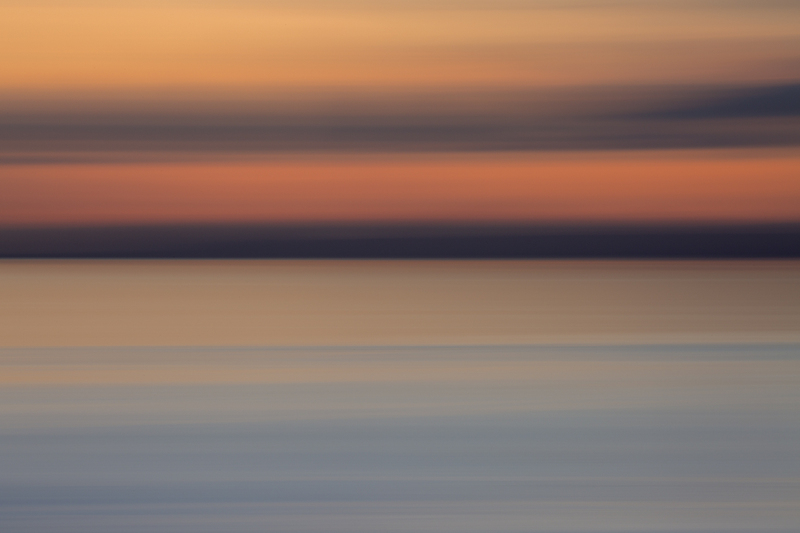 Thanks so much for posting these great pics and giving all the highlight and lowlight tips. My son and I travelled to Inishowen last summer, went to the famine village, and Malin Head — and just loved it. As an American teen, my son was fascinated by the famine village and had a lot of questions for his Irish friends afterwards. Even though it’s a bit odd, it is a wonderful experience. (Of course, mom had to do a bit of translation, as the thick Donegal accent of the docent left poor American teen stumped at various junctures.) Malin Head is just a magical place. Now I’m looking forward to going back and checking our the smokehouse and wool places. Thanks! 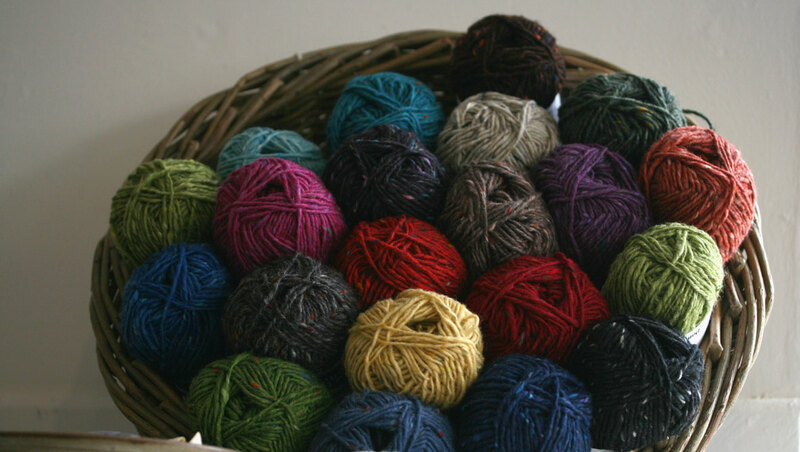 Incidentally, if anyone is ever visiting Studio Donegal, I would recommend going to the actual factory – where they will show you around – not on a tour, just because they are nice, and sell you giant cones of 2kg of yarn for about 20 euro! It may not be Irish but it is lovely yarn! 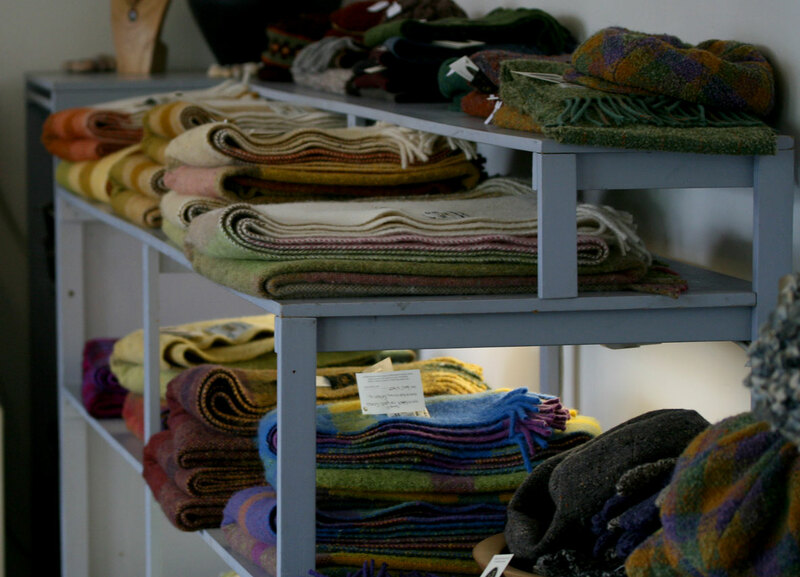 Unless things have changed in the last year I have to report that sadly Kilcarra – Studio Donegal that is – don’t actually use wool from Irish sheep – in fact of the three mills in Ireland, Kerry Woolen Mills are the only ones who do. Crazy, how little Irish wool is used here. I have to defend the Sheep and Wool Centre in Leenane though! I can’t say I enjoyed the chinese tat passing as irish souveneirs, but I liked the place and certainly wouldn’t call it the worst tourist experience – I also think you have to remember it was set up by one family who are just interesting in keeping rare breeds sheep and researching the history – its not funded and not a museum. While it has its flaws and could be so much more in depth (and more accurate! )(and less bleeding expensive! ), sadly it seems to do best from its trade in chinese tat – there are just not enough textile tourists – and I think you have to remember you are a textile historian – I don’t think they get too many of them either! You may have higher standards than the rest of us! Maybe what I’m saying is that in a country starved of information on our textile history and flooded with a load of tourist crap about it, that its good to have somewhere that is at least a step in the right direction. And perhaps my favourite thing about the place was walking out the door – looking at one of the most stunning views in Ireland – Killary harbour, Ireland’s only fjord. If you are ever back this way, the Museum of Country Life in Castlebar is really worth a visit – again, that does not go into half as much detail as I would like on textiles, but there is a lot there – hundreds and hundreds of objects the museum bought from craftspeople to document the way of life from years ago. Anyway, enough ranting! Dooagh sounds amazing – I will have to go. Just added Studio Donegal to my “Places to Visit Someday” map that I keep and reference when traveling. Thank you for another interesting post! I’m so glad you saw Studio Donegal and Donegal Yarns (known as Kilcarra Yarns when I was there in 2002. Note to US readers: this is the yarn that Tahki sells as “Donegal Tweed”). I made a sweater-coat of teal tweed as a tactile memory of my time in Donegal – one of the places on my “long to return” list. Scotland , as seen in your posts, is on the “must get there” list, of course. Did you buy any of that yarn? The colours on their website are yummy. David and I visited Ireland (southern) in 2008 and we had a hard time finding wool shops. Even in the touristy areas there were a few shops selling ready made wool products, but no yarn shops. We plan to visit the northern part next, so your suggestions of places worth visiting are very welcome. 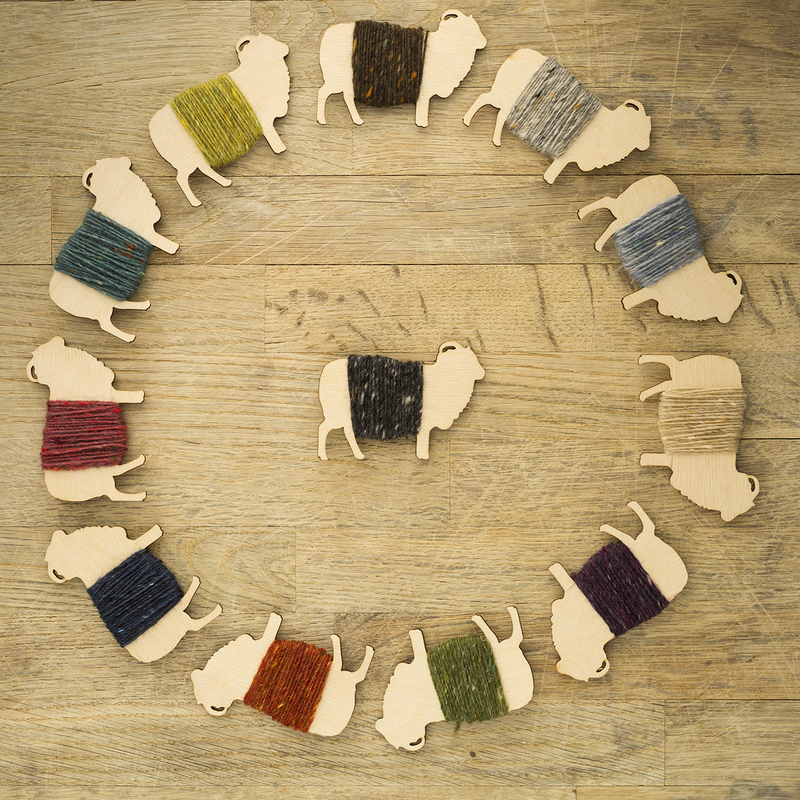 Any suggestions for wool shops in Edinburgh? I’m there the beginning of September. Glad you had a nice time overall. The tourist myths are a constant source of frustration to knitters in Ireland, but thankfully we have places like Studio Donegal to help. Although proper beer isn’t as easily available as it is in the UK, craft brewing is on the up, and there are lots of tasty Irish beers around – if you visit Dublin don’t miss L. Mulligan Grocer in Stoneybatter or The Bull & Castle for some proper beer. Yes – we actually already had a couple of the OSI maps – but just not the one that covered that area of Donegal. Tom will be very excited to hear about the beer . . . The picture at the top with EIRE spelt out in white stones – do you know why that’s there? I’m assuming it’s the one on the way up to Slieve League, between Kilcar and Glencolmcille. A local man told me it was put there during the war to make it clear to German bombers (presumably on their way to Derry, which was a big port for the Atlantic convoys) that they were now over a neutral country. Apologies if you already knew this, btw. It’s been a while since I was last in Ireland, I must go back I love it so much. Good to see you enjoying yourself. It must be 30 years since I was last in Ireland (my only Aunt lived in Galway) …….. after reading about your holiday, I want to go back NOW!!! I do hate ‘craft’ centres which sell bought-in shite – there should be some sort of grading system, chunter, chunter. Or maybe warnings: a three-leprechaun sign for the truly dreadful (or, for Wales where I am, perhaps three women in stovepipe hats). Such a bad impression for visitors, and an false impression of the quality of the work which is really being produced. Grr. Too true, about the low quality knitting. I was in the west of Ireland in may and was depressed by that, and by the usual load of nonsense about Aran knitting patterns, when we visited the Aran island knitwear outlet. Those ganseys ought to be six stitches to the inch and stiff to properly keep out weather. They were, instead, floppy businesses of maybe three to the inch. On the other hand, we had a terrific time walking the Dingle Way and climbing Mount Brandon. SO glad you are enjoying your holiday, low and high points both. Thanks for sharing!! And that yarn shop and the first village sound WONDERFUL. My friend went to Ireland (well she goes every year for the National Irish Step Competition, her daughter dances) and this year she bought me two huge skeins from the Blarney Woolen Mill and a couple of superwash skeins of Tivoli from Dingle…..The huge skeins smell very sheepy….There are pictures here if interested…. 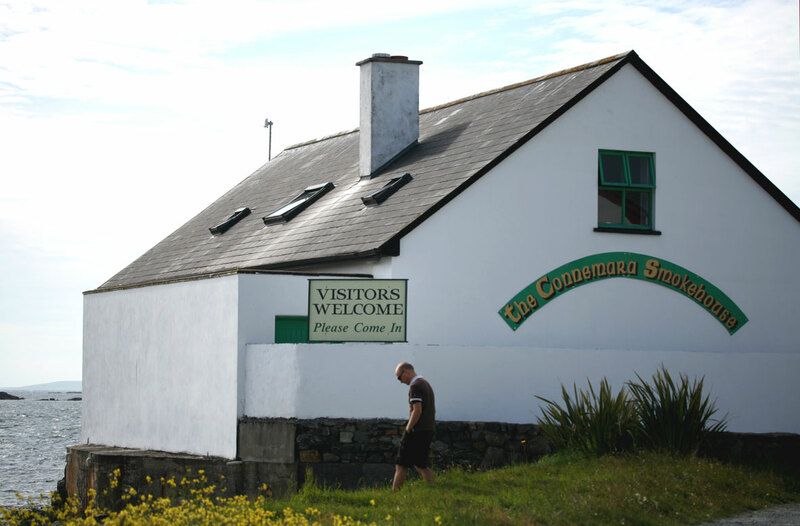 We spent nearly two weeks driving around the south to south-west coast of Ireland in 2008, and had the same kind of horrible tourist experiences as you did. The Waterford factory shop (now closed) was a special low, full of 1970s-styled tat worse than your granny would have, and I wasn’t surprised when they went under. Later, I was on a bus tour in Dublin on which the driver recommended the Donegal workshop as a place where you can ‘see the ladies knitting on their looms’. Loved the scenery; found the tourist service left a lot to be desired. It’s as if they don’t really ‘get’ anyone who isn’t on a tour (and probably from the US to boot). Which is sad, because lots of people from the US don’t want a ‘package’ any more than you and I do. The beer! I know, a complete disaster area. It makes me sad every time I go home too! Living in Edinburgh we really are spoilt rotten on the beer front. I also feel I should apologise for the rubbish map/rambling situations, it really says something that growing up (til 24) in Ireland I only really experienced proper hill walking when I moved to Scotland. There’s just much more of a culture of it here. 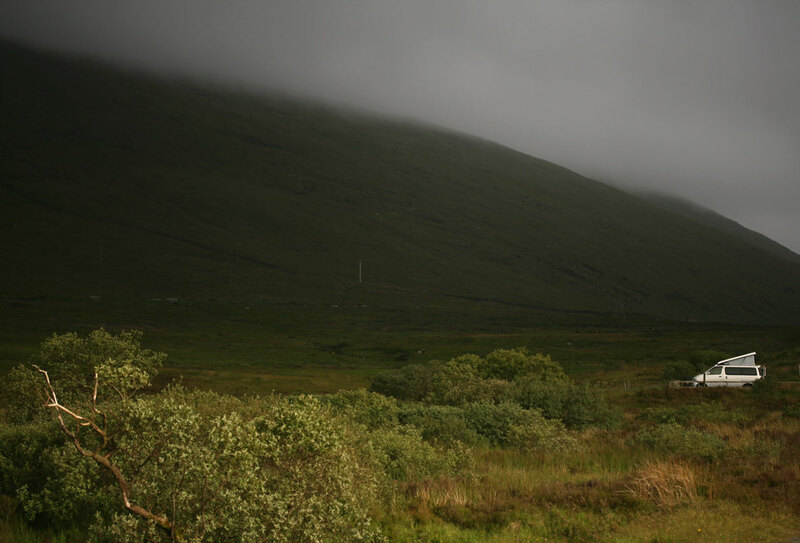 i only spent a couple of days in ireland but ran into the same weirdly rude people and gross music and crappy tweeds, all in one place in galway, that you did at glenveagh — alternating with the most beautiful wild scenery, adorableness everywhere and the best yogurt evar. oh! and this amazing work of psychogeography, much the best i’ve read. Beautiful pictures. We plan to visit family in Mayo next year & are thinking of a mini tour of Ireland – these images of Donegal have put it on the ‘not to miss’ list! Ireland is very different from the UK on the whole issue of both land access and maps. The OS does not include Southern Ireland and the politics of land access are very different from over here, with no real rambler’s rights movement. I found these to be two of the main differences when I lived in Ireland; very few marked public footpaths and not the related, collective obsession with the national mapping agency that we enjoy in the UK. I am glad you found the smokehouse. For me, Kerrygold butter and thick slabs of soda bread are difficult to beat, but Colcannon, smoked fish, and Glennisk organic yogurt are some of the national fare that are really worth having. The beer is not good, but Poitin is excellent, if you can access an illicit supply of this lethal spirit and Guinness – drunk in Dublin, near the giant factory where it is made – tastes better there than it does over here. Some say it’s the water, but maybe it’s the context. The only true surviving Irish breed of sheep, I believe, is the Galway, and although there are a few enthusiasts for Donegal Tweed, its production is not the thriving industry today that it once was (understatement.) Lichens were very important in the dyeing of wool for Donegal Tweed, and the most knowledgeable person on all of this whom I met when I lived in Ireland is Judith Hoad who wrote a book about it. Deb Robson spoke of the Galway Sheep while she was lecturing at UK Knit Camp last year and I remember having a long email conversation with my friend Caro about the lack of rare sheep breeds in the Republic of Ireland. 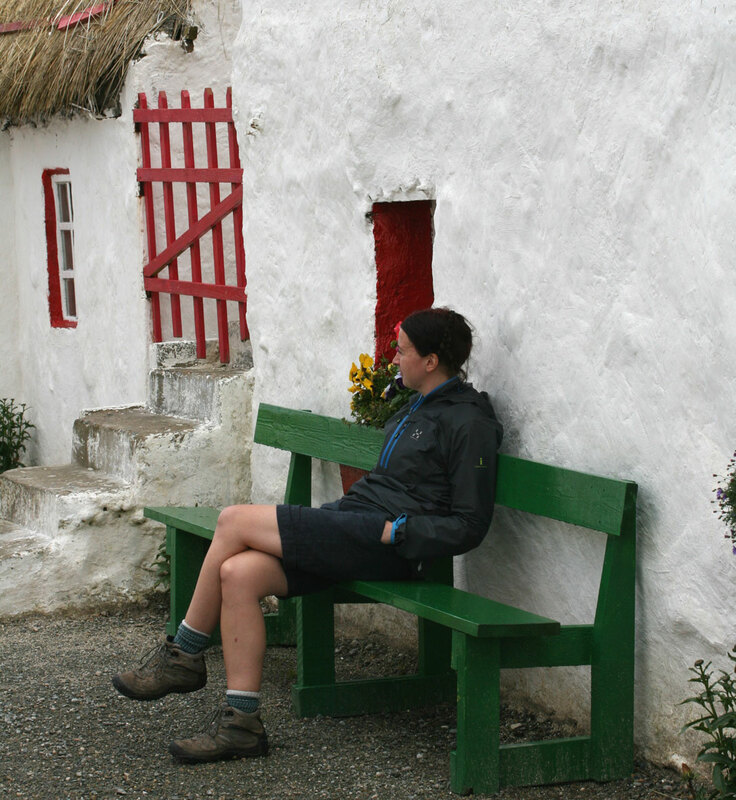 That said, Caro is also a fan of Kilcar and has made some lovely things with the wool that is being produced there… thinking of Ireland and its bogs, butter, crotal, bus eireann buses, thick pints of stout and amazing churches makes me miss it. I’ll have to visit again soon, and this time make some time to visit the fabulous sounding Doagh Famine Village, of which I had not heard before! Oh dear. I’m so full of – let’s not call it jealousy, let’s call it nostalgia. The much loved camper van (VW bay window Wesfalia, front hinge) has gone the way things sometimes have to go. Such memories you bring back. And how Maizy (the small-yappy-type-dog) loved and adored it. Cherish, treasure and thanks for sharing! Loved the highlights and lowlights. Lovely. One of my dreams is to spend a year in Ireland. Beautiful pictures! What a lovely rustic vacation – I’m a bit jealous! The woven tweed photo just made me hyperventilate a little bit… thanks for sharing! As usual an honest and interesting review of lands far far and away! I think I need to bribe my Tom & drive up for a long weekend; I am ashamed to admit I have never visited Donegal (that I can remember). Thanks for sharing some fabulous photos & lovely holiday tips! Ah just sitting here in Toronto Canada with my tea in hand looking for something engaging on line to go with it and up pops your post…perfect timing…’just what I needed! Thank You! I find your picture “Best camping spot” beautiful… amoung the other nice pictures! You make me want to go to Ireland just to visit Studio Donegal. Those scarves are gorgeous.